DD has half an hour of piano practice and half an hour of guitar practice five days a week. She doesn’t practice on the day of lessons and she gets to pick one other day of the week as a “no music practice” day. 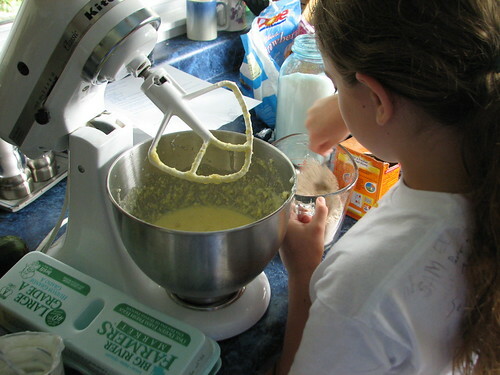 She chose today this week, so I asked if she would like to make banana chocolate chip muffins. Who would say no to that?? She thinks it’s exciting to gather all the ingredients and mix the recipe. I changed the recipe just a smidgen and had DD use 1 c. all purpose flour and 1/2 c. whole wheat flour, and we used margarine instead of butter. Next time we’ll try it with 1/4 c. margarine and 1/4 c. applesauce. 2. Cream the butter and sugar with a mixer. Add eggs and mix well. 3. Dissolve baking soda in the sour cream. Let it “rise” for a minute, then add it to the butter and egg mixture. Mix well with beater on medium speed. Add bananas and blend in. 4. Add flour and baking powder together. Mix in thoroughly, but no longer than necessary. Add vanilla. 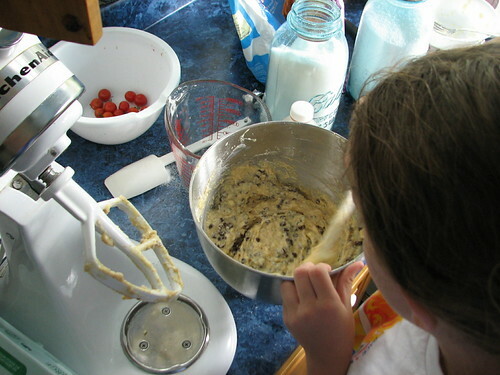 Stir in chocolate chips by hand. Fill muffin cups. Bake for 25-30 minutes. Recipe makes 18 muffins. I should have taken a picture of the sour cream and baking soda mixture. DD was VERY impressed with all the bubbling and rising! 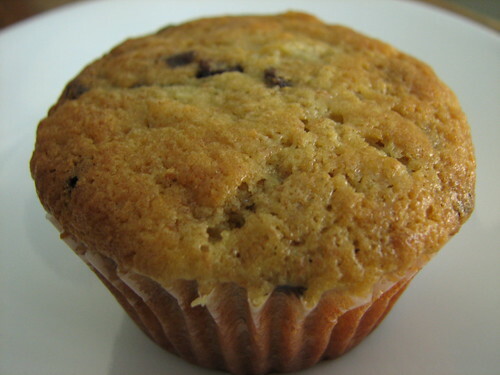 DD takes a snack to school each day and wants to take a muffin tomorrow. Success, I’m thinking. 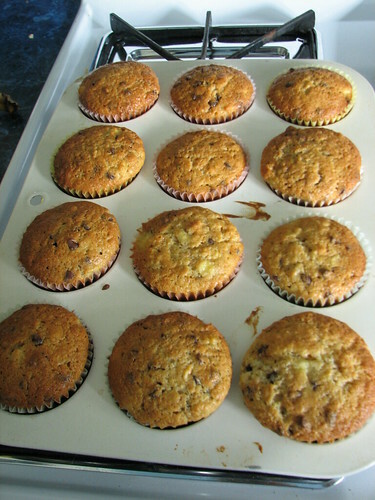 This entry was written by ~~Rhonda, posted on August 28, 2008 at 10:09 pm, filed under Recipes and tagged recipe "chocolate-chip banana muffins". Bookmark the permalink. Follow any comments here with the RSS feed for this post. Post a comment or leave a trackback: Trackback URL.